Jan. 25, 2011, 10 a.m.
By Joshua Benton @jbenton Jan. 25, 2011, 10 a.m.
It’s the kind of quick turnaround the book industry usually saves for sports championships and quickie clip-jobs on royal weddings: Tyler Cowen’s new book was announced last Wednesday and is available for purchase today. Of course, that kind of turnaround is a lot easier when your goal is downloads to Kindle & Nook rather than the shelves of Barnes & Noble. Cowen is a noted libertarian economist at George Mason University who writes for The New York Times and other esteemed publications — but he’s probably best known as the coauthor, with Alex Tabarrok, of Marginal Revolution, the very popular economics blog they’ve run for approaching a decade. Cowen had something he wanted to say about ongoing debates over the slowing rate of American income growth. But, as it turned out, he had about 15,000 words to say — too long for a blog post, not structured like a magazine article, and not long enough for a hardcover to earn its space on Borders bookshelves. So instead, he’s publishing The Great Stagnation: How America Ate All The Low-Hanging Fruit of Modern History, Got Sick, and Will (Eventually) Feel Better as an ebook, priced at $4. For someone with a number of solid physical-book sellers on his CV, it’s an interesting move to publish in a format akin to a Kindle Single. “I believe [ebooks] will be one piece of our new publishing future and here is your chance, as a reader, to try it out,” he told Marginal Revolution readers. Via email, I asked Cowen a few questions about why he went the ebook route and how it fit his project. His answers — which, to my knowledge, feature the world’s first direct comparison between a libertarian economist and ambient techno musician Aphex Twin — are below. Joshua Benton: What made you want to publish The Great Stagnation in ebook form? Was it difficult to convince your publisher, Dutton, to go along with the idea? Did you consider publishing it directly, without a publisher? Tyler Cowen: Dutton was all for the idea. Today, I still think that publishing with a major company makes a book a much more focal event. Maybe it won’t be that way forever, but it is for now. Plus they made it easy for me. So why not do it? JB: If the ebook platform didn’t exist, what do you think you would have done with the book’s content? Chop it down to a magazine piece? Turn it into a series of blog posts? Inflate it up to 250-page hardcover length? Would it have found a useful life otherwise? TC: No ebook format, no book. At least in this case. I may try the format again, of course. I don’t like to stretch ideas to excessive length and magazines often want everything to be driven by the anecdote, which doesn’t really fit here. JB: You give away the product of lots of your thinking every day on Marginal Revolution, and it seems to have been very good for your career. Do you worry that putting good Cowen material into a format that relatively fewer people will have access to might not maximize its value to you? Do you think publishing as an ebook will limit the work’s influence among policy makers, journalists, economists, and such? TC: I don’t worry much about influence in any case. I am more concerned with figuring out the problems for myself. Most of all, I wish to influence me! And I don’t have a grand plan either. I’ve noticed the musical careers of Richard D. James and now also James Blake. They put out a lot of work, in a lot of different formats. In the case of James, it is often under a different name (Aphex Twin, Polygon Window, etc.). I suspect no one has it all and I doubt if either of them worries about that fact or has a systematic plan. It’s simply another way to think about one’s output — not a worse approach — and who reads all of my stuff anyway? JB: Given that you’re writing about a topic tied to the current economic moment, how important was it to be able to avoid the usual months between manuscript submission and the actual arrival of physical books in stores? TC: Critical. It would have taken too long to get a physical book out, plus it would have taken much longer to fill out a 250-page format. To me that was a major attraction. JB: Thanks to Marginal Revolution, you bring a large, pre-assembled potential audience to this experiment. How important will that sort of independently earned audience be to the success of ebook publishing going forward — given that the traditional gatekeeping and promotional roles of publishers and bookstores would seem to be marginalized in an ebook environment? TC: Without MR, or something comparable, this publishing experiment could not have happened. That’s one reason why so many people are starting or maintaining blogs, to have influence with their other projects. JB: You mentioned the other day that John B. Thompson’s Merchants of Culture: The Publishing Business in the Twenty-First Century is “the best book on the economics of contemporary publishing.” What lessons or ideas did you take from it? TC: That I already knew a lot about the world of publishing. Still, it is an excellent work. POSTED Jan. 25, 2011, 10 a.m.
Benton, Joshua. "Why Tyler Cowen’s new book will be on Kindles, not bookstore shelves." Nieman Journalism Lab. Nieman Foundation for Journalism at Harvard, 25 Jan. 2011. Web. 23 Apr. 2019. Benton, Joshua. "Why Tyler Cowen’s new book will be on Kindles, not bookstore shelves." Nieman Journalism Lab. Last modified January 25, 2011. 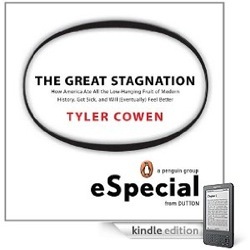 Accessed April 23, 2019. https://www.niemanlab.org/2011/01/why-tyler-cowens-new-book-will-be-on-kindles-not-bookstore-shelves/.